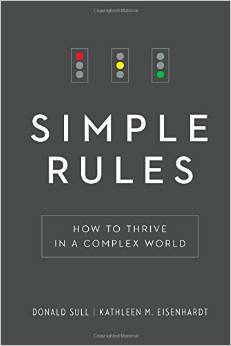 “Simple Rules” is about creating simplicity even in complex situations. The book covers a wide range of topics which benefit from rules including science, medicine and business. The authors share how they have helped organizations implement these concepts. According to “Simple Rules” there are 6 types of rules; for example timing and boundary rules. The section on creating rules to help business was particularly interesting. Employing their own advice the authors give 3 simple criteria for generating rules for growing your business. “1. Figure out what move the needles. 2. Choose a bottleneck. 3. Craft the rules.” The section on personal rules was also worthwhile. Summary: Very readable book, a bit long in sections heavy on anecdotes, but with to few it would fall flat. I can see returning to this from time to time to employ the concepts in my work or personal life.